"Although there are hundreds of millions of workers and peasants, they don't count. You can ignore them. You can also rob and exploit them. It's not a problem. The most important thing is to get the powerful on your side." 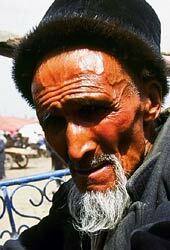 A trader at Kashgar Market, Xinjiang Autonomous Region. It isn't easy, running China, with its 1.3 billion people and 56 officially recognized ethnic nationalities. It's a vast mix of languages, living standards, beliefs and customs. Run it successfully, and you have a prosperous, innovative, powerful empire to rival any the world has seen. Make mistakes, and the chaos will be vast and terrible. China is run by the Communist Party, which bases its legitimacy on delivering both stability and the conditions for prosperity. But stability is under threat as economic boom strands millions at the margin. Meanwhile rampant corruption is sapping people's trust in the Party. Officials are increasingly seen not as public servants but as profiteers. This episode films patrols along China's border with Kazakhstan, Party meetings, officials in Tibet trying to impose authority at the grass-roots, a village election, and a corrupt embezzler in prison, reprieved from a death sentence. Chinese people throughout, from farmer to Minister, speak frankly about the problems the country faces and the ways forward. The Party attracts eager young recruits and is trying to re-invigorate its older members. They visit sites of communist achievement, like the Red Flag Canal, hoping to be inspired by the revolutionary zeal of the past. "If all Communist officials today were like those who built this," one Party member exclaims, "the Communist Party would rule forever."